Hugo Albert Emil Hermann Dingler studied mathematics, philosophy, and physics with Edmund Husserl, Felix Klein, Hermann Minkowski, David Hilbert, Wilhem Roentgen. and Woldemar Voigt at the universities of Erlangen, G?ttingen, and Munich. He graduated from the University of Munich with a thesis under Aurel Voss. He failed to get a Privatdozent position in mathematics at Munich, but was given a position to teach "Methods, Teaching and History of Mathematics." Thus Dingler turned from mathematics to philosophy of science. In 1934 Dingler was dismissed from his teaching position. He told several interviewers that this was because of his favorable writings concerning Jews. In fact he was dismissed as part of a general retrenchment and not at this time for political reasons. Later his reinstatement was opposed for political reasons, but by 1940 he had joined the Nazi Party and was given a teaching position. Of Dingler?s 1944 book Lehrbuch der Exakten Naturwissenschaften only thirty copies survived wartime bombing. 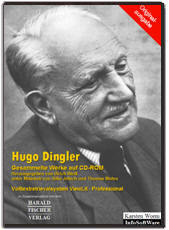 Dingler?s position is usually characterized as "conventionalist" by Karl Popper and others. Sometimes he is called a "radical conventionalist", as by the early Rudolf Carnap. Dingler himself initially characterized it as "critical conventionalism" to contrast it with the "na?ve conventionalism" of other philosophers such as Poincar?, but he himself later ceased to call his position conventionalist. Dingler agrees with the conventionalists that the fundamental assumptions of geometry and physics are not extracted empirically and cannot be given a transcendental deduction. However, Dingler disagrees with conventionalists such as Henri Poincar? in that he does not believe there is freedom to choose alternative assumptions. Dingler believes that one can give a foundation to mathematics and physics by means of operations as building stones. Dingler claims that this operational analysis leads one to Euclidean geometry and Newtonian mechanics, which are the only possible results. Dingler opposed Einstein?s relativity theory and was therefore opposed and snubbed by most of the leaders of the German physics and mathematics community. This opposition, at least to the theory of general relativity remains in the work of his follower Paul Lorenzen. Beitrage zur Kenntnis der infinitesimalen Deformation einer Flaeche, Amorbach, 1907, thesis directed by Aurel Voss. Grundlinean einer Kritik und exakten Therie der Wissenschften, 1907. Die Grundlagen der Physik: synthetische Prinzipien der mathematischen Naturphilosophie, 1919/1923, 336 S.
"Kritische Bemerkungen zu den Grundlagen der Relativitaetstheorie," Physikalische Zeitschrift, V21, 1920, 668-675. Reissued as pamphlet, Leipzig, 1921, 29 S.
Das Problem des absoluten Raumes, 1923. Die Grundgedanken der Machschen Philosophie, 1924. Metphysik als Wisenschaft under Primat der Philosophie, Munich, 1926. Der Zusammenbruch der Wissenschaft und der Primat der Philosophie, 1926. Der Zusammenbruch der Wissenschaft und der Primat der Philosophie, 1931. Philosophie der Logik und Arithmetik, Munich, 1931. Geschichte der Naturphilosophie, Berlin, 1932. Die Grundlagen der Geometrie: ihre Bedeutung f?r Philosophie, Mathematik, Physik u. Technik, Stuttgart, 1933, 76 S.
Das Handlen im Sinne des hoechsten Zieles, Munich, 1935. Die Method der Physik, Munich, 1938. Max Planck und die Begr?ndung der sogenannten modernen theoretischen Physik, 1939. Vom Tierseele zur Menschenseele, Leipzig, 1941. Lehrbuch der Exakten Naturwissenschaften, Berlin, 1944. edited posthumously by Paul Lorenzen as Aufbau der Fundamentalwissenschaften, Munich, 1964. Storia filosofica della scienza, 1949. Il metodo della ricerca nelle scienze, 1953. Die Ergreifung des Wirklichen, Munich 1955. Reprinted, with intro. by Kuno Lorenz and Juergen Mittelstrass, Frankfurt, 1969.